The new Canon S100 makes a number of additions and improvements to the Canon S95. Available in early November for $429 in the USA. With the updated sensor, slightly larger ISO range, and full HD 1080p video capability, the S100 promises to be a popular model for underwater shooters. Although reviews talk about better image quality and more dynamic range, we would be surprised if the effects are very noticeable underwater, given the fact that the sensor size is the same, and the pixel size has actually decreased. The Canon S95 has excellent image quality underwater. In the end, I think IQ differences will depend on the quality of the new zoom lens the S100 has. Speaking of zoom lenses, the Canon S100 is a 24-120mm zoom, which means it may need a longer port in the housing. The S95 is well known for its ability to take several wide-angle and fisheye lens options, due to the small port size. If the S100 lens extends out longer, this may limit the lens options for accessory wide-angle lenses. Another important piece of information will be the built-in macro capability. The macro on the S95 without a macro lens was just ok, let's see how it will change with the new lens on the S100. Canon today announces the launch of the new PowerShot S100 – a powerful, versatile and highly compact camera offering photographers extensive control and leading image quality. The most advanced PowerShot S-series model to date, the PowerShot S100 surpasses the high standards set by its acclaimed predecessor, featuring a new f/2.0 Canon lens and an enhanced HS System, which combines an elite high-sensitivity sensor with the very latest in Canon processing technology – DIGIC 5. Packed with upgrades, the PowerShot S100 marks a true step forward for the PowerShot S-series. Its 24mm ultra-wide angle, 5.0x optical zoom genuine Canon lens provides greater power and flexibility, and combines with Canon's Intelligent Image Stabilizer (IS) system to deliver crisp, clear images in stills and movies. GPS functionality records the time and location of every shot, Full HD movie recording captures stunning video, and the powerful DIGIC 5 processor offers fast shooting speeds and even better image quality in all conditions. All of these new features also come in a super-slim body measuring just 26.7mm front-to-back, available in matte black and titanium silver variants. The PowerShot S100 features the most powerful implementation of the HS System yet. Building on the PowerShot S-series' reputation for providing high-quality, low noise images in low light, the enhanced HS System optimally combines DIGIC 5 processing with a high-sensitivity 12.1 Megapixel 1/1.7-type CMOS developed using Canon EOS sensor know-how – providing an even more powerful basis for low light photography. Supporting a maximum ISO of 6400 at full resolution, the camera fully-utilises the high performance of the CMOS sensor and the power of DIGIC 5 to reduce image noise – offering the reassurance of excellent image quality in all conditions. Designed to achieve new and advanced levels of image quality, DIGIC 5 analyses four times more image information to create each pixel, recording more detail and colour from a scene than ever before. Processing speed is also six times faster compared to the previous processor, efficiently managing the increase in scene information and simultaneously reducing the appearance of image noise by up to 75%1. The PowerShot S100 features a new, high performance lens developed and manufactured using the same methods and expertise as Canon's leading EF lenses. A benchmark in Canon optical technology, the lens supports 24mm ultra-wide angle coverage for shooting horizons and landscapes, and an extended 5.0x optical zoom for zooming into distant scenes or subjects – all while offering a bright f/2.0 maximum aperture, and a light and compact design. Intelligent IS utilises Canon's highly-effective 4-stop optical Image Stabilizer to counter camera shake in stills and Full HD movies. Providing seven modes of stabilisation2, Intelligent IS automatically identifies the scene and adapts the optical Image Stabilizer settings for optimal compensation. Panning IS is ideal for following racetrack action, ensuring the IS system only corrects the axis vertical to the direction of movement, while Macro IS features Hybrid IS technology for shooting clear close-ups. Powered IS uses Canon camcorder technology to film distant subjects when using the zoom, while Tripod mode switches off IS when the camera is on a stable surface or attached to a tripod. The PowerShot S100 offers full manual control over shooting settings and modes. Designed to fit seamlessly into a photographer's existing workflow, it supports RAW format shooting and offers compatibility with Canon's Digital Photo Professional (DPP) software as standard, providing a perfect second camera for DSLR users. The popular Lens Control Ring, synonymous with the modern PowerShot S-series, also provides a tactile way to control picture settings such as focus and exposure. Users can assign the Lens Control Ring to a number of different image parameters, including shutter speed, ISO sensitivity and aperture, allowing them to fine tune their exposure in 1/3-stop increments. The 'Ring Function' button and rear Multi-Control Dial can also be custom-assigned to control other pre-selected functions, providing complete flexibility to serve different user styles. Using the power of the DIGIC 5, the PowerShot S100 is ideal for capturing fast-moving action. High-speed Burst HQ is perfect for everything from sports to parties, capturing a rapid sequence of eight full resolution shots at up to 9.6 shots/sec. 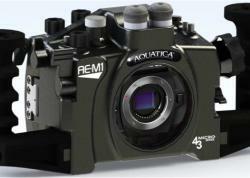 For recording the drama of high-speed action, Super Slow Motion Movie mode also records videos at 240 fps (QVGA quality) or 120 fps (VGA quality). For easy shooting in a range of situations, Canon's Smart Auto mode ensures great results by selecting the optimum settings for a scene from 32 variables. New Multi-area White Balance also makes images look more natural by detecting scenes with two different light sources and applying area-specific white balance correction. For instance, when shooting a portrait with flash under tungsten lighting, the camera will simultaneously apply tungsten white balance to the background and flash white balance to a person's face, ensuring both the subject and background look natural. Ideal for users who want to record the location of every shot, the PowerShot S100's integrated GPS unit records where and when images are taken, so users can keep an accurate record of the place and time their pictures are taken. Additionally, the GPS Logger facility records a user's journey, allowing them to review their travels by using the supplied Map Utility software which integrates with Google Maps3. 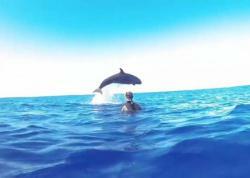 Stunning Full HD (1080p) video is also captured at 24 frames per second with stereo sound. 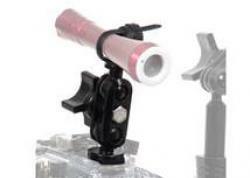 The 5.0x optical zoom can be used during video capture, while Dynamic IS and Powered IS mode within Intelligent IS counteract camera shake when recording whilst moving, or when using the zoom. An HDMI-CEC port makes it easy to share videos, allowing users to play images back on compatible HDTVs using the TV remote. A large, premium-quality 7.5 cm (3.0") PureColor II G LCD display is perfect for framing and playback, with a fine 461k dot resolution that offers high contrast and excellent colour reproduction. A tempered glass outer layer provides a wide viewing angle and resistance to scratches, and new grips on both the front and back of the camera body offer improved handling, making this the ideal pocket camera for enthusiasts. The PowerShot S100 is instantly compatible with a range of Canon accessories. The new HF-DC2 is an external flash unit that can be used to supplement the on-board flash, allowing users to capture a broader range of subjects. Users can also explore the world of underwater photography with the new optional Waterproof Case WP-DC43, which provides water resistance to depths of 40 metres and protects the camera from dust, dirt and damage – making it perfect for snorkelling or diving on holiday. 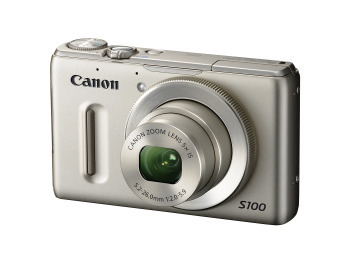 Owners of the PowerShot S100 can also join the CANON iMAGE GATEWAY, an online facility for sharing photos and video. The CANON iMAGE GATEWAY Online Photo Album provides up to 2GB of personal storage capacity – enough room for hundreds of high-quality images. Please support the Underwater Photography Guide by purchasing your underwater photography gear through our sister site, Bluewater Photo & Video. Click, or call them at (310) 633-5052 for expert advice on Canon cameras & housings!